Daily bathing helps in keeping the patient comfortable and healthy. It speeds up the recovery process. Some patients are unable to perform this activity on their own. Therefore, they need your assistance. For a bedridden patient, it’s very difficult to move to bathroom for taking bath. You are required to provide bed baths to such patients. 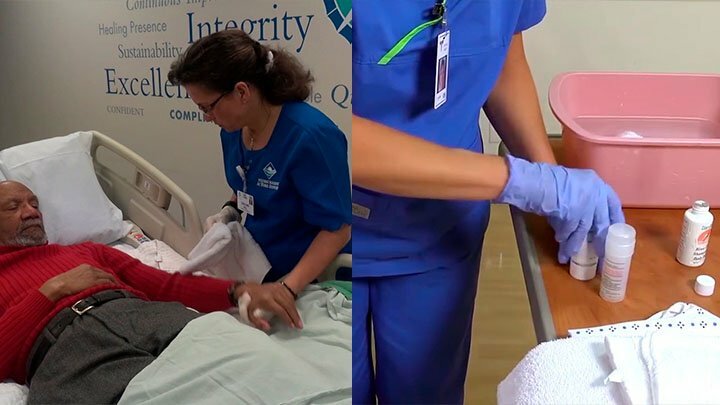 While assisting with this activity, you can evaluate the physical condition of the client and inform any issue (like bedsores) to the in-charge nurse immediately. If you are going to appear for CNA skills test and want to know the appropriate procedure to give a partial bath (bed bath) to the bedridden patient, go through this article. You need to rinse your hands using proper hand-washing procedure, before commencing your work. Wear the gloves. Provide a friendly greeting to your patient. Inform them that you are going to help them in bathing. To preserve the privacy and dignity of the patient, pull the curtains on the window and close the doors of the room. Fill the basin with water having temperature of 105 to 115 degrees. Check the temperature of the water by dipping your inner wrist or elbow. Ensure that water is not too cold or too hot for the client to bathe. Take out the medical equipments that are not necessary for the patient, at the time of assisting them in bathing. You should start with washing the face of the patient with the help of a washcloth or sponge. Then, move down to their arms. Next, wash their chest, abdomen, legs, back and perineal region. In order to avoid the spread of germs, utilize the separate clean cloth for each body part. If necessary, change the linen of the patient and provide them fresh linen. If your client desires, apply lotion to exposed skin. After patients’ bath has been completed, assist them to lay or sit down in a comfortable position. Allow them to dress themselves, if they are able. Dispose the supplies used for the bath and gloves. Then, wash your hands again. Pull the curtains and close the doors, before assisting the patient to bathe. The temperature of the bathing water should not be too low or too high. Let the patient help you as much as they can. Use different sponge or wash cloth for each body part of the client, in order to prevent spread of germs. Take care of the comfort of the patient, during the whole process. What Does an Examiner Observe When You Give a Partial Bath to the Bedridden Patient? Whether you have washed your hands? Tip- Begin the procedure with washing your hands. If you have prepared the patient for partial bath? Tip- Remove all the unnecessary medical equipments, before bathing the patient. Whether you have filled the basin with water at temperature preferred by the patient? Tip- Fill the basin with water at temperature preferred by the patient. It should not be too cold or too hot. Check it by inserting your inner wrist or elbow. If you have used the correct procedure to rinse and dry the body of the client? Tip- Start rinsing with face. Then, wash arms, chest, abdomen, legs, back and perineal region. Don’t forget to use clean sponge for each part of the patient’s body. Whether you have removed the linen used for bathing purpose and put it in a correct container? Tip- Remove the linen, if it gets soiled or wet and provide a fresh one. Put dirty linen in a correct container. If you have prepared the patient for dressing? Tip- After bathing the patients, help them in returning to their comfortable position. Allow them to dress themselves, if they can. Whether you have rinsed your hands after completing the task? Tip- After disposing the bath supplies, rinse your hands. A CNA needs to take care of many patients. As per the guidelines provided by the states, each nurse aide has to look after a specific number of patients. However, you are given that number of patients, so that you can pay them proper attention. Bathing is an essential routine activity to keep the client healthy. As a certified nursing assistant, you may not get enough time to provide bed bath to each of your patient. Our expert suggests that in this condition, you should clean the vital areas of the patient on the daily basis. Well, it’s not an ideal thing to do, but it’s the only way to help out your clients each day in this mandatory activity, prior completion of your shift. First, collect the soap and fill the basin. Undress the patient. Start with washing the patient’s face. Then, rinse the neck region because if not washed each day, the gunk gets collected in this region. If you are bathing a female patient, wash under the breasts to prevent sore development and gunk build up. Once done, apply some powder to keep them dry and clean. After that, wash the under arms and spray deodorant. Then, move down and cleanse their private parts. At last, dress them and help them in getting out of bed. Here is the video demonstration of how to give a partial bath (bed bath) to the bedridden patient. Have a look.